The media plays an important role in shaping how our communities understand affordable housing, especially public housing. News coverage can galvanize support for residents, developments, and organizations—and it can also shed light on injustices and push decision makers to make changes. As reporters who have played a key role in covering the public housing crisis in Southern Illinois, Molly Parker and Isaac Smith will discuss how they investigated unsafe living conditions, including lead paint, toxic mold and rampant infestation, in Cairo, as well as the actions of authorities leading up to and after the public learned about the situation. The presentation will begin with a showing of the film “People Still Live Here” by Isaac Smith and Steve Matzker. During this opening plenary session, Parker and Smith will also discuss how housing organizations can approach local media and get their stories told. We were fortunate to have representatives from the Office of the Illinois Attorney General provide keynote remarks in light of the Attorney General’s unexpected absence. Hagan works as the Chief of the Consumer Protection Division at the Illinois Attorney General’s Office and both Snyderman and Muchin have worked closely with the Attorney General’s office on the National Foreclosure Settlement Program. During our annual membership meeting, Housing Action staff gave updates on our work in Public Policy Advocacy, Public Education and Organizing, and Capacity Building. Some highlights include the new law on protections for rent-to-own homebuyers for which we helped advocate, our recent $1.2 million HUD award in intermediary funding, and our expanding AmeriCorps VISTA program. Where you live affects your entire life: housing insecurity puts children and families at risk for a wide range of health and developmental complications, whereas the foundation of a quality, stable, affordable home can act like a vaccine. 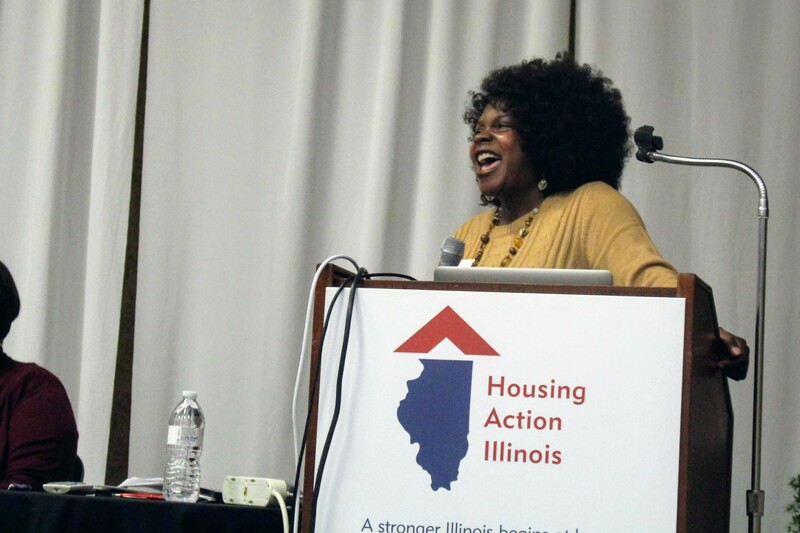 An increasing awareness of this intersection of housing and health has led to many new initiatives around the country, some of which we discussed during last year’s conference with keynote speaker Dr . Megan Sandel—but what is happening here in Illinois? This year’s Housing + Health Partnerships plenary will look at collaborations that have been established between nonprofit housing and homeless service practitioners and healthcare providers in different parts of our state. Hear from leaders who have launched an entire Impact Health initiative to transform Bloomington; a healthcare director at the helm of a pilot program in Chicago that moves frequent ER visitors experiencing homelessness directly from the hospital rooms into supportive housing; and a key player in a coalition that is integrating home modifications with proactive health care services to help seniors age in place within Chicagoland suburbs. Learn how these partnerships started up, what they’ve been focused on to date, and how you can begin to do the same in your community. No amount of lead poisoning is safe, especially for children. It is linked to lowered IQ, developmental delay, and many other physical and behavioral health problems. Although significant progress has been made in Illinois, there is still much work to be done to reduce the number of children with lead poisoning in our state. Attend this session to find out about existing and emerging efforts to eliminate lead hazards in homes and expand Early Intervention services to children (0 – 3) who have been exposed. We’ll also discuss innovations in lead poisoning prevention that the Illinois Department of Public Health is advancing, including lowering the definition of lead poisoning to be consistent with the federal Centers for Disease Control and Prevention (CDC) reference value for elevated blood lead level. Hear about two recent reports which reveal the direct and indirect costs of housing segregation in the Chicago region, including billions of dollars in lost income, lost lives, and lost potential. We will discuss how promoting integration would reduce income inequality, lessen crime, and promote education opportunities. We will also share the report’s recommendations to address the challenges of segregation at the local, regional and state level, including housing solutions and more broad interventions. Learn from the experiences and strategies of advocates and an elected official currently working to mobilize people at the local level to address housing needs in their communities. We will discuss issues such as understanding and making the case for local needs, building relationships with elected officials, supporting specific housing developments, developing issue campaigns, building a coalition, and establishing partnerships. We will offer suggestions for expanding your advocacy activities that can be adapted to fit local circumstances and varying access to resources. Tenants with an eviction filing in their history often discover it is very challenging to find a landlord to rent to them, even when the filing never resulted in a negative judgment against the tenant. Do you know how many eviction cases are filed in your community that do not result in a judgment against the tenant? Join us as we share key findings from county and local level data on eviction filings and judgments throughout Illinois, now available through Matthew Desmond’s Eviction Lab, as well as important takeaways from our own report on eviction filings in Cook County. We will discuss strategies for addressing eviction in your community and share information about how you can join our statewide campaign to expand access to sealing records. Learn actionable strategies you can implement immediately to support your program participants in achieving long term self-sufficiency. This training will introduce Dr. Beverly Ford’s person-centered, outcome-based case management philosophy. This strength based approach moves away from “doing for” participants what they can and should do for themselves. Learn to use open, thinking questions to encourage program participants to evaluate options, make independent decisions, take action, and solve their own problems. This interactive training session will include presentation of concepts, group discussion, question and answer, practice exercises and access to reproducible templates. While federal policies are critical in establishing best practices for addressing homelessness, they can leave agencies guessing at how to implement the framework for positive change in-house. The most effective organizations use an interdepartmental, agency-wide approach to provide services and secure the resources necessary to realize program priorities. Join us for a panel discussion on how to develop an action plan that utilizes the talents of an organization’s entire staff and volunteer force for direct client treatment, advocacy, fundraising, and more. Many people who are experiencing homelessness or at risk of homelessness have a significant history of trauma. Trauma is strongly correlated with addiction, incarceration, chronic health conditions, unemployment, and mental health issues—all obstacles for maintaining stable housing. During this session, learn about tools to implement strategies and practices to provide trauma-aware services, such as understanding the causes and effects of ACEs (Adverse Childhood Experiences) at the individual and community level, preventing secondary trauma, and avoiding burn-out in professionals who work with individuals and communities that have a history of trauma. Creating relationships that foster hope and resilience can help end unsheltered and chronic homelessness. Join us to learn ways to approach and build these relationships. We will discuss topics such as the stages of change model, individualized assessment and outreach strategies, provider collaboration, and community engagement. You will have the chance to put these concepts into practice by collaborating with peers to evaluate scenarios utilizing the strategies we cover during the session. Housing professionals committed to serving their clients with confidence and integrity must understand and strictly comply with federal, state and local fair housing laws. During this session, we will give a helpful overview of these laws, as well as general guidance on various aspects of reasonable accommodation and modifications as they relate to tenants with disabilities. We will discuss topics such as how the term “disability” is defined by law, the difference between reasonable accommodations and reasonable modifications, costs associated with meeting requests, unique issues that arise for certain housing providers, and legal remedies. Participants will gain practical knowledge through examples and hands-on activities developed from real-life cases. 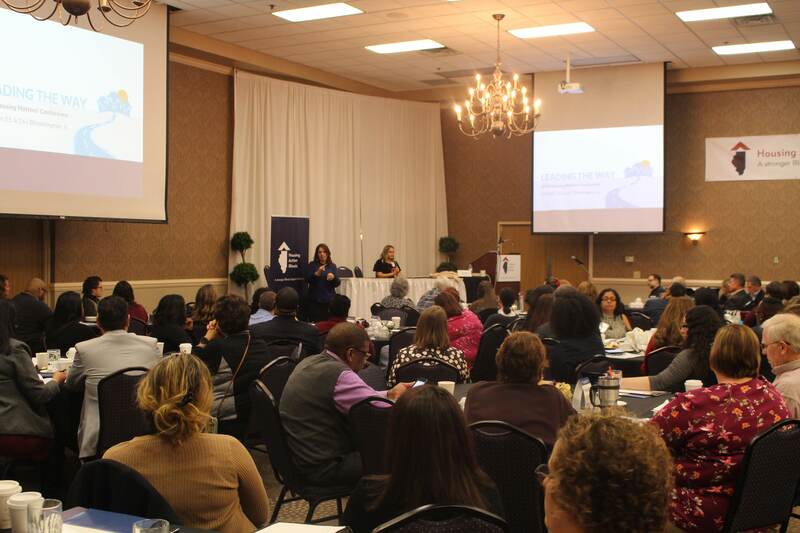 The Illinois Housing Counseling Coalition (IHCC) connects housing counselors across Illinois to discuss housing counseling topics, troubleshoot problems, and stay on top of new issues. During this session, we will discuss priorities for our 2019 agenda, which needs your input. As a housing counselor, what are the issues you are seeing with your clients? What are the trends in the industry that you think counselors should be focused on? Bring us your ideas and concerns, and find out how you can join the IHCC in 2019. Starting in August 2020, all housing counseling required by or provided in connection with HUD programs may only be provided by HUD certified housing counselors who have passed HUD’s national exam. During this study group session, gear up for Housing Affordability, one of the exam’s six focus areas. In a supportive peer-learning environment, we’ll cover the key points of the module and go through practice questions to get familiar with the exam style and structure. Housing Affordability – Join us to discuss the pros and cons of renting vs. buying, calculating income and qualifying ratios, and understanding the implications of credit. Fair Housing – During this session, you’ll hear an overview of the Fair Housing timeline and changes to legislation, in addition to identifying housing violations. Hear from a developer and an architect about the design, regulatory review, and construction processes for two scattered site developments for people with disabilities. Home First, which was completed in 2015, involved purchasing 70 foreclosed condominium units in Chicago and suburban Cook County. The units were renovated to include accessible/adaptable features for residents with mobility impairments, common areas were made more accessible, and leasing was targeted specifically to Colbert consent decree members relocating from nursing homes to independent living. Access Peoria, which was completed in 2016, involved constructing eight new duplexes on scattered sites in the East Bluff neighborhood of Peoria. Buildings were designed to a high level of accessibility within very tight site constraints. Learn about site selection strategies, regulatory requirements, funding, design/construction processes, challenges, lessons learned and positive outcomes for residents. Join us to talk about organizing coalitions to protect vulnerable housing projects and about creative finance strategies that can expand development possibilities. We’ll take inspiration from the lessons learned by the Michaels Development Company, which recently worked on two groundbreaking SRO preservation projects. Learn about The Carling, whose affordability was preserved through leveraging a variety of subsidies (including CHA vouchers, IHDA Section 811, Chicago Low Income Housing Trust Fund) and whose building was donated by the City of Chicago to a nonprofit partner to generate the Illinois Donation Tax Credit equity. Then learn about The Marshall, currently under construction in the high-income Old Town neighborhood, which is entirely Project Based Section 8. We’ll talk about how advocacy and collaboration played an important role in these initiatives and explore how the strategies used for them could translate for communities around Illinois. The recently enacted Tax Cut and Jobs Act will significantly affect the development of affordable housing across the country. This is the most sweeping change to the federal tax code in more than three decades, and it preserves but changes many significant programs, including the Low Income Housing Tax Credit program and the New Market Tax Credit. How will the new the tax law impact demand for these and other credits? Can the newly created Opportunity Zones encourage new community and economic development investment? Join industry experts for a in depth discussion of the tax law and what it may mean for your development projects. There is a growing need for independent living options for individuals with intellectual and developmental disabilities (I/DD). Could this be a new development opportunity for your organization? Join us to discuss collaborative and creative approaches for creating housing options to meet this shortage. Clearbrook and the Association for Individual Development will share their strategies and experiences in undertaking development projects for individuals with I/DD in Illinois. Learn about their creative approaches, community collaborations, and lessons learned that might benefit your organization and your community. This year, in addition to our regular workshop tracks, we will have targeted breakout sessions. Marketing can get your name in front of those who need your programs the most and help your community understand your mission. Unfortunately, many organizations in the nonprofit industry lack a dedicated marketing professional, which means that important work is being done by someone who already has a full load of other job duties. For the last year, Housing Action’s Timm Krueger has been working with housing counseling agencies to help them build their capacity and reach their target audiences—now, he’s bringing it to the Housing Matters! conference. In this session, you’ll learn actionable marketing and communications techniques, how to improve your messaging, and have the chance to ask your most pressing marketing questions. As part of our work to expand the capacity of our member organizations, Housing Action manages a network of nearly 30 full-year VISTA positions and 30 summer-long VISTA positions placed with our member organizations throughout the state. AmeriCorps VISTAs can help research and solve problems on the local level, build your capacity, and help you identify new talent. In just 2017, our VISTAs recruited and managed nearly 6,000 volunteers and raised more than $550,000 in cash and in-kind donations. They also work on projects that can’t be easily captured by numbers, such as developing and managing educational programs or doing marketing and communications. Join us to learn more, hear firsthand from host sites and current VISTAs, and ask questions that will help you figure out whether VISTA is right for your organization. If the program is a good fit, you could be hosting an AmeriCorps VISTA at your organization by June 2019. The Community Revitalization Challenge is a new initiative led by Housing Action Illinois that connects community-based organizations with financial institutions to design and launch potentially Community Reinvestment Act-eligible projects. These collaborations aim to expand access to affordable housing and promote economic development opportunities for low- and moderate- income residents throughout Illinois. Pre-registration is required for participation in the roundtables. Additional information can be found here. Please view our 2018 Sponsorship Packet for more details and contact Kristin Ginger with questions.